We don't know when this Place of Worship was founded, and it has since been demolished, but we don't know when. Old Maps of 1923-24 1:2,500 show a "Mission Church" at this location, but by 1968-1972 it is labelled as St Luke's Church (C of E), and had a Church Hall at the rear. It was on the south side of Sycamore Road, a short distance west of its junction with Quarry Road, adjacent to the Sycamore Inn. 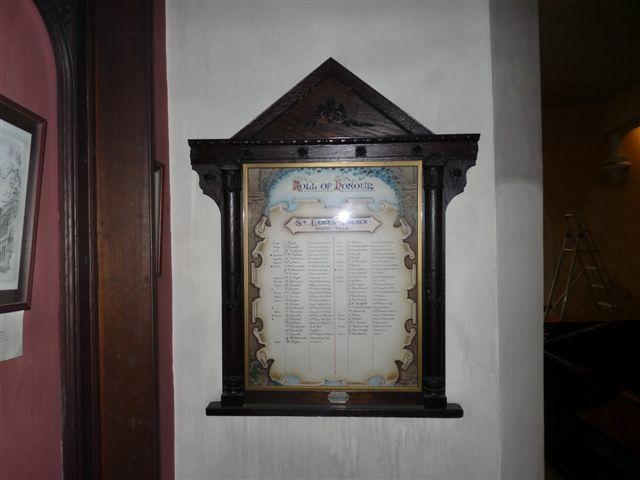 Sadly, the building was destroyed by fire, sometime after my OS Street Atlas of Derbyshire was published in 1995, when it was still marked as a place of worship; however its Roll of Honour has survived, of which photographs are provided. Information about the fire was provided by the incumbent of St George's Church in New Mills in conversation with Mike Berrell. 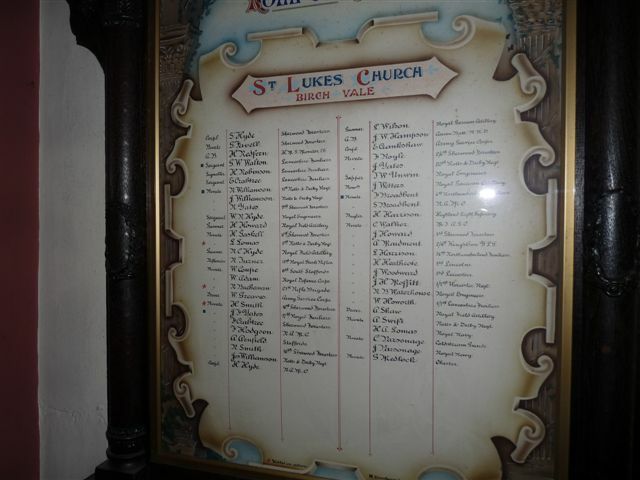 This suggests the Roll of Honour may also be held in St George's Church. Birch Vale is a village 2 miles east from New Mills, and 1 mile west from Hayfield, and at the time of publication of Kelly's Directory of 1932, in Hayfield parish, and with a station on the Great Central section of the London and North Eastern railway. Old Maps suggest the building stood on raised ground, difficult to see in the present day, as the site of the church is wooded over. The area below it, however, where the hall may have stood, appears to have become a car park for the Inn. St Luke's Church (Demolished), Birch Vale, Hayfield shown on a Google Map. Information last updated on 8 Nov 2014 at 10:58. This Report was created 6 Apr 2019 - 02:51:14 BST from information held in the Derbyshire section of the Places of Worship Database. This was last updated on 6 Feb 2019 at 15:49.